Parking has been an issue in Shepherdstown. There is street parking available on German St and the surrounding areas. Metered parking (9:00 am - 6:00 pm) is strictly enforced. On the weekends there is free parking at Shepherd University just a few blocks away from the Bistro. The second floor Salon is available for private events for business meetings, receptions or dinner parties. Seating available for 30 in several configurations. We can also accommodate up to 50 for receptions. Our garden is available for smaller private events with seating up to 12 under a wisteria covered pergola. We have closed the restaurant for an evening - with all three dining areas available for a special occasion. Bistro 112 is a neighborhood French Bistro in the center of historic downtown Shepherdstown. It is a favorite of local residents and a haven for travelers passing through - who enjoy the area for its history, theater, music, biking trails, small shops and river activities. The Bistro, decorated in eclectic art, offers creative French food at affordable prices. Built in 1830, the Bistro has several dining areas: front bar, upstairs salon or outdoor patio under wisteria. We prepare local ingredients into French favorites such as steak au poivre, coquille St Jacques, roasted chicken, salad nicoise, pommes frites, savory & sweet crepes, house made soups and rich desserts. Rooms are available for private events. We will be open for Easter offering our full luncheon menu with some entrée specials for those that celebrate Easter with a midday dinner. This is a delightful restaurant. It doesn't swagger, but it does embrace. The food is consistently good, as is the ambiance. The service could not be more professional or more friendly. PLUS it's dog friendly and charges a most modest $10/bottle corkage. I have no reason to feel as though I'm having lunch or dinner in France...but I do! I was looking forward to this dinner which was a special treat for my granddaughter who spent a year studying in France. Bistro 112 gets good ratings on Yelp and it's kind of expensive, so I expected it to be excellent. The menu choices were slim and not very enticing. My granddaughter ordered the duck dinner, which was the only thing that looked interesting to her. She enjoyed it, although she felt the outside of the duck was too charred. I think the Duck dinner was ok for $32. However, I didn't care for my vegetarian dinner at all. I was very disappointed. The eggplant was one large piece of eggplant coated with bread crumbs and cheese, and heavy, not delicate or tasty. The ratatouille was not a real ratatouille, nothing like any ratatouille I've ever had. 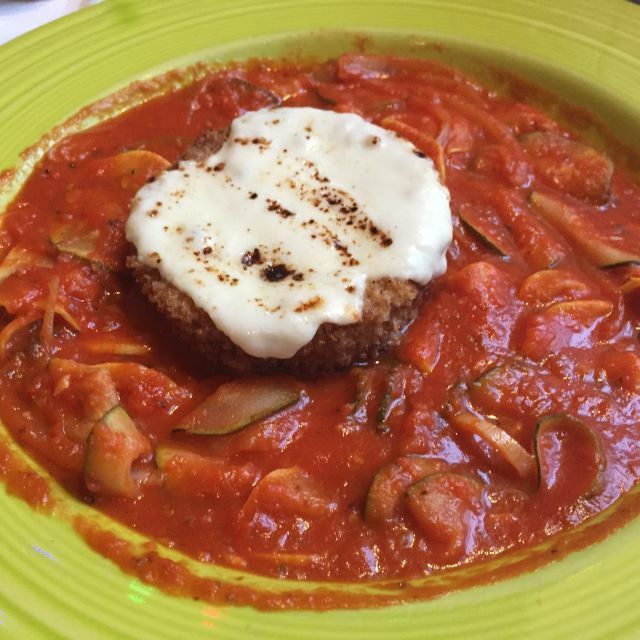 It was made up of very thin slices of zucchini in an overpowering tomato sauce that had no flavor. I feel that there's no excuse for any restaurant to service a dish that doesn't taste good. But especially a French restaurant that has a high rating. I've had better French food on Air France. The restaurant was nice and atmosphere was good. But without good food, I would never go back. My wife and I have dined here many times. Always a treat. Fast and friendly service. Nice atmosphere. food is always delicious. Our go to spot in Shepherdstown. The food was very good and our server was timely and helpful. My wife and I got a 2nd floor window table, very romantic and comfortable. The meal was delicious. A very enjoyable dinner. The 4 of us enjoyed our experience. Our table was ready when we arrived and the staff were welcoming. The duck breast was delicious. Planning to return. We had an excellent dinner at Bistro 112. The service was attentive and efficient and the food was very nicely prepared. We will be back on our next visit. The food was very good. The place was clean and comfortable.. The overall cost was pricey for the four of us after we tipped but the food was worth the extra cost..
A great meal in a wonderful ambiance. It was a great way to celebrate my husband's birthday! The French Onion soup was fabulous! My wife and I had a great experience at Bistro 112. The food was amazing. I probably had the best French Onion Soup I ever had. The service was amazing. Michelle, our server, was so friendly, helpful and professional. The ambiance was great. The restaurant is small, but we felt like we were in France. The prices were a little high, but overall we really enjoyed our dinner and experience. Although the food was good, the service was soooo slow! There was such an incredibly long lag time between finishing our salads and our entrees and between finishing our desserts and seeing a server to request the bill. The bottle with water was not refilled. Perhaps they need more servers and/or additional staff to bus the tables. A nice way to end our day at Antietam.. Lovely art filled house of vintage charm. Interesting menu with charming staff. We were there on a cold winter day and left thinking that the town and restaurant merited a return visit. Parking was easy . We had prompt and professional service. Very low noise, second floor. If you want a more secluded, quieter spot, go up to the second floor. Attentive service. Seated us early upon request. Wonderful food. Nice Valentines Day treat! Food, service and atmosphere were great. Will be a repeat customer. ALWAYS a pleasure dining here. Quiet, comfortable, intimate accommodations, each selection expertly prepared, service is courteous and personable. Overall, wonderful.What more could you ask for? NOT a place for kids - leave them home. Service was great. Weather wasn’t optimal and the staff gave me updates on road conditions around the restaurant. It was very quiet due to people only at the bar area. Tables are super close to one another but it was empty during my visit. Waitress was great and said the menu items in an appropriate accent. Would recommend friends to visit. Best duck I have had in years. Their French Onion Soup is awesome. We use this lovely place as our celebration site. Great wait staff!! The food was it's usual fabulous, the waitress was very attentive.. and I would have been really surprised if it wasn't, every time I have gone in the Bistro 112 it has been a great experience. I have even used them for our Board of Directors dinner, and the feedback from them was all positive. On a cold winter's night we experience a warm and cozy dining atmosphere in Bistro 112. Michelle was very kind, cordial and happy to have us at her table. The salmon and pasta bolognese were fresh and warmly presented, as was the bread served upon arrival. We recommend the House French carafe: perfectly suited to both dishes. We will return for possibly appetizers at the colorful bar or lunch. A wonderful experience and a stark contrast to the high-ceiling, granite tables and hard floor restaurants that produce ear-splitting decibels of noise. Wonderful dinner while sitting at a window table with a view of the snow coming down in beautiful Shepherdstown, WV. Excellent food and service is outstanding. Great experience and lovely building: that is all I have to say. This our favorite restaurant! Food is always great and the service is outstanding. Whenever we have a special occasion, we pick the Bistro to host it. It had the fortune to see her and her brilliant personality for some months now. A great lunch with great friends thanks to the good folks at Bistro 112. Took my wife, in-laws to the Bistro for lunch. Outstanding food, great ambiance, and very professional and courteous service. 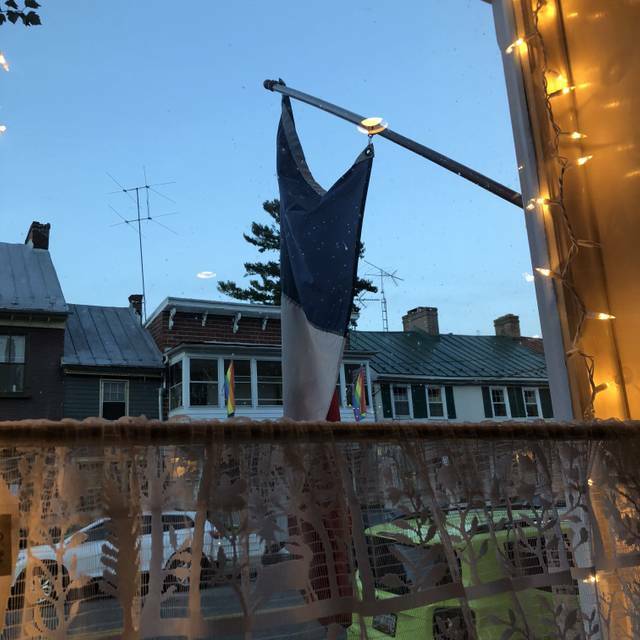 Definitely a great place in Shepherdstown to get a wonderful bowl of French onion soup and enjoy a little bit of great cuisine! This is truly a hidden gem. The food was fantastic from bread to crème brulée. We were charmed by the staff and the decor. Wonderful meal! Pepper steak was great. Price was high compared to other venues. Short ribs special was mostly fat and uneatable. A favorite spot for the locals, with a cozy little bar and lovely French onion soup and a wonderful staff. Lamb was over cooked. Potatos and green beens were not seasone, pretty bland in taste. Service was great. Definitely excpected an amazing meal for the price. Basic selection of classic French food bistro. Each of the plates we had was nicely presented, cooked at perfection and delicious. Michelle the waiter is cool. The duck is the best I've ever had. My son and I met for a pre-Thanksgiving dinner and had a delicious French meal with a great wine (owner's recommendation) and unhurried service. Will definitely do again soon. I enjoyed the bisque , omelet was slightly over cooked but still satisfying. Small cozy seating. My wife loved her mussels . We will come back. Service was very good. Food was great. Must try the Ratatouille. Also the Caipirinha. Always a delight to sneak away to Bistro 112 for lunch, especially on a chilly, damp day. The French Onion Soup is outstanding. The wine selection is quite fine and far more than reasonably priced. All that, plus splitting a favorite sandwich with a loved one, and having warm, friendly service -- all the ingredients for a fine afternoon meal and welcome pause to a hectic day. Cozy atmosphere and wonderful ambiance. The staff is always friendly, welcoming, and helpful. Bistro 112 is the perfect spot for a martini or a glass of wine at the bar or a delicious meal in the dining room. 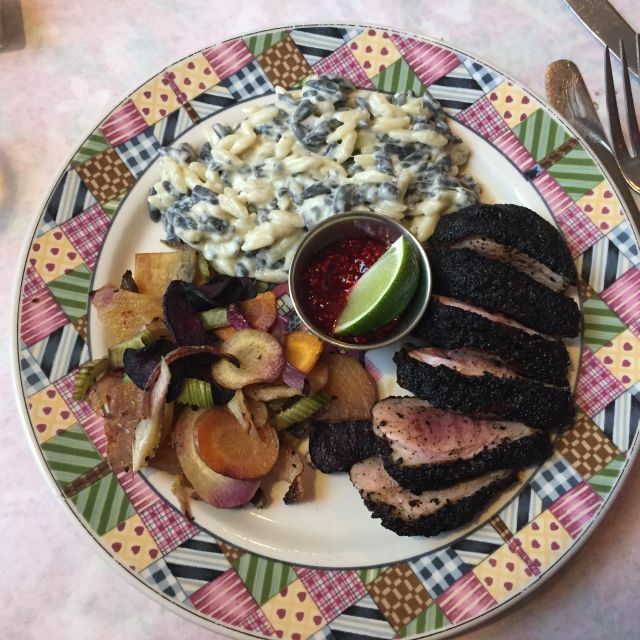 If you are visiting Shepherdstown, put Bistro 112 on your list of dining options. Wonderful ambiance, service, and dinner! Would definitely come here again! One of the top spots to be enjoyed in our quirky wonderful town. Shepherdstown is worth a weekend, or a lifetime. Bistro 112 is a player in making it happen! Great experience. Waitress was charming! Food was great. Loved eating upstairs!